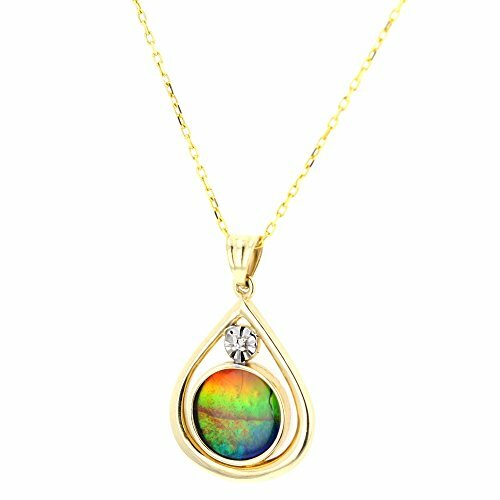 The facts about ammolite, a rare and unique gemstone that offers an affordable alternative to opal. Ammolite is a relatively new player in the jewellery trade. Having been granted official gemstone status in 1981 this rare and unique gemstone isn't on everyone's radar yet, but it should be. The brilliant colors of ammolite are captivating and encompass all colors of the rainbow from radiant reds to gorgeous greens and brilliant blues. Truly a phenomenal gemstone, this flashy newcomer may eclipse opal in terms of popularity and affordability. This page is designed to give a brief introduction to vibrant and amazing ammolite jewellery. Image: Fossil ammolite by Tara Wojtaszek, © 2007. Ammolite is an organic gemstone made of aragonite (CaCO3), the same mineral that forms pearls. For a gemstone to be classified as 'organic' it must have been formed by a plant or animal. Examples of other organic gemstones are pearls and amber. Ammolite is the multi-coloured iridescent outer layer of a fossil, ammonite. An ammonite is an ancient variety of squid that was abundant during the time the dinosaurs roamed the earth. They became extinct near the end of the Cretaceous period, 65 million years ago. 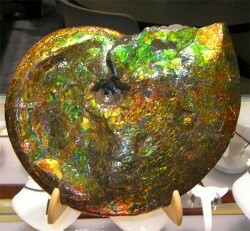 Ammolite occurs in association with two species of fossil ammonites: Placenticeras meeki and Placenticeras intercalare. The ammonites were preserved in a sediment layer in the Rocky Mountains, called the BearPaw formation, and ammolite was formed from intense heat and compaction over a period of approximately seventy million years. Ammolite is very rare and the only gem quality deposit is concentrated near Lethbridge, Alberta north of the Montana border. Two mines exist in this area, Korite International and the Aurora Ammolite mine. Ammolite, the gemstone, is not considered a fossil, but whole ammonites with an ammolite exterior are considered a fossil and require a permit to be exported out of Alberta. Ammolite came on the jewellery scene in the seventies and was granted official gemstone status in 1981. But, it wasn't until 2004 that ammolite was declared the official gemstone of Alberta. Lethbridge, the closest city to the main ammolite deposit, followed suit in 2007 declaring it their official gemstone. Despite being a 'late bloomer' with respect to popularity, ammolite has been in use for centuries. The Kainah, a First Nations tribe in Alberta, recognized the power of ammolite and have worn and used ammolite in talismans. They refer to it as Aapoak, which means small, crawling stone. The ammolite deposit is located on the Kainah reservation and accordingly the mines pay royalties to the tribe depending on how much land has been mined. The Blackfeet tribe of Montana also has a history of utilizing ammolite, which they refer to as Iniskim, or 'buffalo stone'. They recognized it as a powerful gem and wore it for good luck and prosperity on the buffalo hunt. Nowadays it is coveted not only for its beauty but for its Feng Shui properties. Feng Shui Master Edward Kui Ming Li visited the Korite ammolite mine in 1999 and declared it the Seven Coloured Prosperity Stone. Ammolite is typically a gray or brown colour but it is the iridescence that makes it spectacular. The majority of ammolite have red and / or green iridescence but special and extra rare specimens will have yellow, orange, blue, purple or even pink, the most coveted and rarest colour of all. 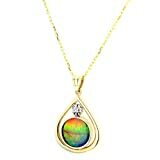 Top quality gemstones, those displaying three or more colours in vibrant hues, are set in gold (often with diamond accents) creating a gorgeous and unique piece of ammolite jewellry. The quantity of ammolite is very limited and the supply of gem quality ammolite is expected to be depleted in twenty years. An in depth look at the gemstone ammolite. A comprehensive guide on grading, what to look for when buying, and how to care for your ammolite jewellery. A guide to the Feng Shui properties and benefits of wearing ammolite jewellery. Oh... I've seen the fossils, but not the jewelry... it's beautiful. Wire wrapping is a special technique used to make jewelry by hand. Understanding a little about jade colors and jade origin and deep traditional past gives you a greater appreciation for the true beauty of Jade.